Unless you've been living on the Moon for the last few years, you've probably run across the term 'crowdfunding'. If you haven't heard of it before, the concept is actually extremely simple, albeit incredibly powerful. It uses a 'pay-what-you-can' model distributed over a large number of potential customers to acquire funding for projects. There are often various tiers of contributors, so that those who contribute more to a project get more out of it than those who make the minimum contribution. For example, say you want to make a documentary, but need money for development costs and have no film studio contacts or capital. 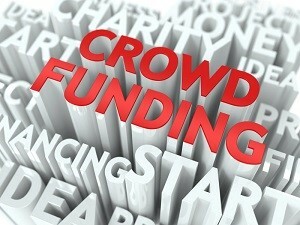 Posting your plan on a crowdfunding site, you would entice people to contribute to your documentary project. People who contribute $5 get a mention in the film credits, people who contribute $20 get a copy of the film and a credit mention, people who contribute $40 get an additional 'Making Of' documentary, the film itself, and a credit mention, etc. Once your goal is reached, the money is released and you can begin to work on your film. The most popular crowdfunding sites like Kickstarter and Indiegogo are enabling entirely new revenue models across the creative sphere, from video game development to documentary filmmaking to industrial engineering. But at long last, the crowdfunding model has reached into the gallery world - at least, in the United Kingdom. A new project entitled Art Happens has been launched by the charity Art Fund, in an attempt to bring the incredible power of crowdfunding to the UK art world. Five galleries so far have launched projects using the Art Happens platform: St. Fagan's National History Museum in Cardiff, the Bowes Museum in County Durham, Compton Verney in Warwickshire, the Museum of the Gorge in Shropshire, and the Jerwood Gallery in East Sussex. At the moment, the most popular project is only 12% funded, with 18 contributors and 74 days left to reach the fundraising goal. This, quite naturally, begs the question of whether or not the initial selections are interesting enough for those who follow the tech-centric crowdfunding payment model, or whether the project simply has yet to go viral, which everyone appreciates is an incredibly difficult thing to predict. With luck, the Art Happens project will trigger other galleries and artists to begin to explore new methods of financing their projects - after all, nobody really wants to be too much of a starving artist!